Adenocarcinoma Pancreas otherwise known as pancreatic adenocarcinoma is most common type of pancreatic cancer found. It accounts for 85% of pancreatic cancer cases. Pancreatic cancer is one of the leading causes for cancer deaths in the world. Pancreas is a gland, which is present on the backside of stomach. Pancreas produces enzymes, which play a vital role in breaking down the food we consume, and required for maintaining blood sugar levels in our body. Pancreatic cells that produce enzymes for breaking down of food are the initial place where cancer starts. Adenocarcinoma pancreas is the type of pancreatic cancer, in which cancer begins in the ducts of the pancreas. During the early stages, adenocarcinoma pancreas symptoms are not so specific, or only mild symptoms are observed. It is generally detected only when it has spread to other parts. Jaundice, which is yellowing of eyes and skin, is one of the common symptoms of adenocarcinoma pancreas that is initially observed. Cancer caused in this type of pancreatic cancer occurs near to common bile duct. This will result into pressing and obstruction of bile duct. Ultimately, this results into jaundice. 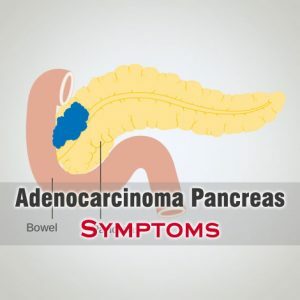 Another commonly found adenocarcinoma pancreas symptoms is experiencing pain in abdominal area, mid-back or lower back area. Pain experienced may be worse during nighttime, and gradually become severe overtime. Loss of appetite is also commonly observed in pancreatic cancer. This and improper digestion will result into unexplained and sudden weight loss. Enlarged gallbladder is also observed in pancreatic adenocarcinoma. Bile gets build up in gallbladder due to blockage of common bile duct by cancers. This makes the gallbladder to become enlarged. There are few more commonly found symptoms of adenocarcinoma pancreas. They are nausea, vomiting, constipation, fatty tissue abnormalities, enlarged liver, depression, blood clots in veins particularly in legs, and onset of diabetes. Get the latest health Information and Health Tips from EHealthyBlog.com! What Are The Common Causes For Liver Cancer?